It is only preseason. It is only preseason. It is only preseason. 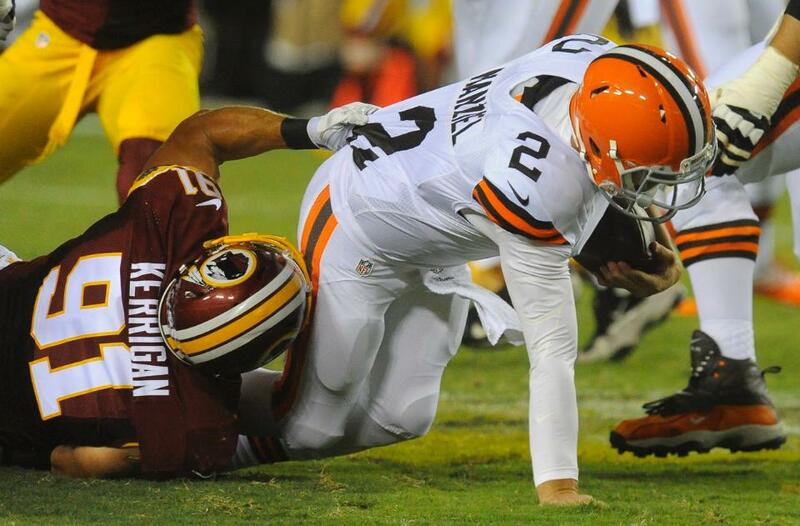 We have to keep reminding ourselves of that after watching the Cleveland Browns on Monday night against Washington. The running game didn’t look all that bad, as Ben Tate and Terrance West combined to average 4.5 yards per carry, which compared to last season’s baggy pants farce is Pro Bowl-caliber work. The defense had three interceptions and was active all over the field – at least when the officials weren’t throwing a flag. (The Browns were penalized 10 times). Other than that, nothing much went right, especially with quarterbacks Brian Hoyer and Johnny Manziel. And that, Browns fans, leaves the team with a major problem on its hands. Things started out bad for the Browns on offense with a sack and a penalty on the first two plays. It only went downhill from there. In an ideal situation, you know, the kind that are some common with this team, head coach Mike Pettine would name a starter and let them get ready for Saturday’s preseason friendly with St. Louis. But with neither quarterback looking anywhere near capable of leading the team, we’re not sure what Pettine should do. And it sounds like Pettine isn’t really sure, either. We’re all for chemistry and cohesion – who isn’t? – so, in hindsight, maybe it would have been a good idea for Pettine to have picked a starting quarterback at the outset of training camp and let him work exclusively with the starters. Instead, Pettine opted to try and balance things out and let either Hoyer or Manziel grab the job. It’s a nice idea if it works, but it is also a risky one as we are all learning. Rather than have a clear-cut (if uninspiring) starter, the Browns currently are facing the reality of having two quarterbacks that have put up a combined 18 points in the preseason and that don’t look at all ready for the season to begin. At the beginning of training camp we were on board with the idea of Hoyer entering the season as the starter and being patient with Manziel. But now with both players struggling, there seems to be little reason to start Hoyer over Manziel – if neither is capable of getting the job done, why not start the Johnny Football era now? But it is easy to forget just how raw Manziel still is and maybe sitting to start the season – or even the entire season – may not be such a bad thing. Of course, we’re not sure how that will accelerate his progress. After all, once the season starts the starting quarterback gets all the practice time, so outside of film work (which he would be doing anyway), Manziel will mostly be standing around during practice. So if the Browns don’t start Manziel, that means they are going to roll with Hoyer, who hasn’t looked anything like the player we all saw for two-plus games last season. No accuracy, no quick release, no rallying the team – nothing. Maybe the pressure is too much for him or maybe we would have eventually seen this last season if he hadn’t been injured. Now that we’ve talked ourselves in circles, we are no closer to figuring out what the Browns should do. 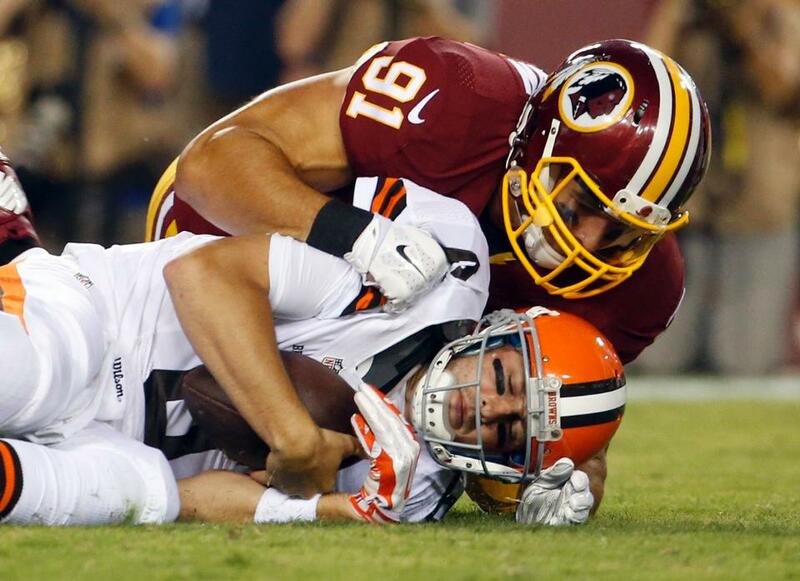 But this we do know: the regular season starts in 19 days, whether or not the Browns are ready for it. When Sept. 7 rolls around and the Browns take the field in Pittsburgh, if the quarterback play isn’t any better than it has been these past few weeks the team is going to have a lot more to worry about than one of their quarterbacks flipping off the opposing team. That, at least, is one thing we can all agree on.